Early on in my relationship with Steve he gave me a copy of the Alan Watts book, Psychotherapy East and West. In the book Watts talks about people who are “in the world, not of the world.” Steve thought that described me. He was right. I have never followed the path well travelled. Recently, I was in Mexico walking along the beach with two women I had met, one in her 70’s and the other in her 80’s. We were talking about travelling and adventures we had had. The woman in her 70’s turned to me and said ”You must have had parents that instilled this sense of adventure in you.” The truth is, my parents never left the U.S. My father died when he was 49 and my mother worked two blue collar jobs and had no time for dreaming about much more than a few minutes of relaxation and a good night’s sleep. My mother was smart and very well read. She knew there was more out there in the world than what she had experienced and although she never traveled anywhere, she somehow gave me the courage to have an adventurous life. From the time I can remember I always had an entrepreneurial spirit. When I was young I often tried to convince my friends to go along with my “business” schemes. 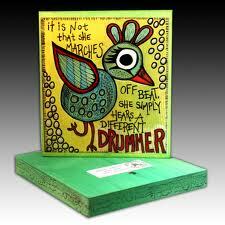 I have always marched to the beat of a different drummer and somehow, I knew that I wasn’t cut out for a traditional life. In retrospect, I must have known that I was in the world, not of the world. My grandparents, my mother’s parents, were entrepreneurs. They came to the US in the early 1900’s to escape the threat of anti-semitism in Russia and made a life for themselves by buying a building with apartments on the upper floors and commercial businesses on the street level. They lived in one of the apartments and operated a bar/restaurant below. They didn’t read or write English and yet, they had the courage to do this. They never got rich but they did do it their way. When I got my first “real” job, I realized that the 9-5 life was not for me. That’s when I began my first real entrepreneurial adventure and started a business called WEARE (Women’s Educational and Resource Enterprise). I had a business partner and the business lasted about 5 years. It was an amazing experience and, like my grandparents, I didn’t get rich. I needed to make money, so I landed a corporate job that had me in the role of “intrepreneur.” That was someone who worked for a corporation but created a kind of business within the business. It was a great ride and I stayed for more then 10 years. During that time, I got married, had two children, and eventually gave it up, moved to Maine with my sons and my husband, and together, we started a business, The Greenshoe Group, that lasted more then 20 years. We never got rich but we did travel all over the world and met amazing people and lived a life of dreams. It was wonderful. At the age of 63, I moved to Korea with Steve, and went to work for a university. I thought my days of entrepreneurship were behind me. NOT! I lost my job last June because of a mandatory age law and I wondered what I would do. I need to work and although I am soon to be 66, retirement, at least full retirement, seems far away. So what does a 65-year old expat woman in Korea do? She starts a business! I launched my newest venture this month called “Coaching To Go.” I’ve taken all my expertise in consulting, counselling, teaching and life experience and I’m coaching expats who want to either return home or change the current circumstances of their lives. I was interviewed by the local expat magazine and I have already gotten clients. All this to say that life is filled with surprises, adventures and risk. I probably won’t get rich in this business either, but I will have fun and isn’t that what life is all about? I learned a long time ago that security is overrated and trying to predict and plan for everything in the future is futile. Jumping out there and doing what I love is more important than knowing what tomorrow will bring. I do plan and I’m not cavalier, however life happens and I don’t want to miss it. I sometimes find myself worrying about the future, and as I like to say, the committee in my head is often working overtime, but mostly I go with the excitement of what each day will bring. Getting older does bring new challenges both physically and emotionally. I try to keep in shape and keep up with the young friends I have in Korea. They keep me young in so many ways. I realized that’s one of the secrets of staying young: being around young people and learning from them and absorbing the hopefulness of their lives and their futures. It’s easy to forget your aches and pains when you’re around people who are focusing on the joys of the day. I don’t know how my business will go, or even how long I’ll stay in Korea, but I do know that as long as I’m here, I’ll have some fun and let the next adventure unfold as it will. Being in the world, but not of the world, has its advantages.